We’ve all had to deal with a broken air conditioner one time or another. Usually, the problem is something that can be fixed with a simple repair, but not always. Sometimes you may need to replace your old air conditioning unit. But how do you know when? And who can you trust with the job? 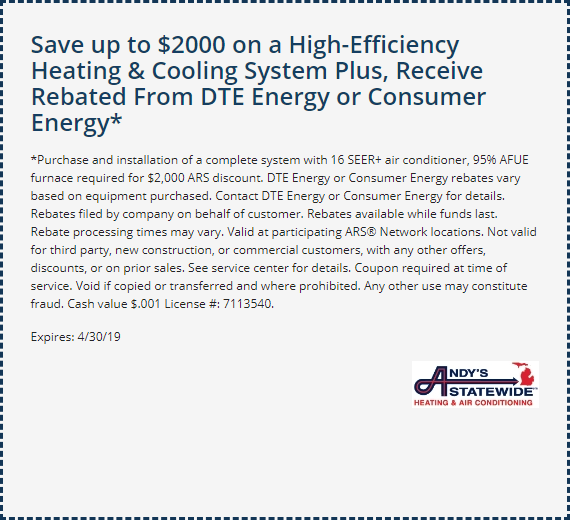 When deciding to replace air conditioning in Detroit, Ann Arbor, Troy, MI and the neighboring communities, trust Andy’s Statewide with a solid history of keeping homeowners comfortable and offer affordable plans and payment options to make this important purchase easier on your wallet. Do You Need an AC Replacement? Is my air conditioner more than 10 years old? Is my air conditioner constantly breaking down or need repairs? Is my air conditioner struggling to keep my house cool? Are my energy bills high during the summer? *Purchase and installation of a complete system with 16 SEER+ air conditioner, 95% AFUE furnace required for $2,000 ARS discount. DTE Energy or Consumer Energy rebates vary based on equipment purchased. Contact DTE Energy or Consumer Energy for details. Rebates filed by company on behalf of customer. Rebates available while funds last. Rebate processing times may vary. Valid at participating ARS® Network locations. Not valid for third party, new construction, or commercial customers, with any other offers, discounts, or on prior sales. See service center for details. Coupon required at time of service. Void if copied or transferred and where prohibited. Any other use may constitute fraud. Cash value $.001 License #: 7113540. If you answered yes to any of these questions, it may be time for a replacement. An Andy’s Statewide comfort advisor can help you decide. Not only that, we can also help you select the unit that’s most appropriate for your home. After all, Andy’s Statewide carries all makes and models of residential air conditioning units in the Detroit area. The expert technicians at Andy’s will professionally install your new system to the correct specifications, so you can attain the maximum efficiency from your new equipment. Plus, thanks to our Exceptional Service Guarantee, your system will be installed to your complete satisfaction. And, with Easy Payment Options, it’s possible to install a new air conditioner on just about any budget. So the next time you notice your air conditioner is acting like it’s on the blink, give Andy’s Statewide a call. We’ll help you keep your cool.